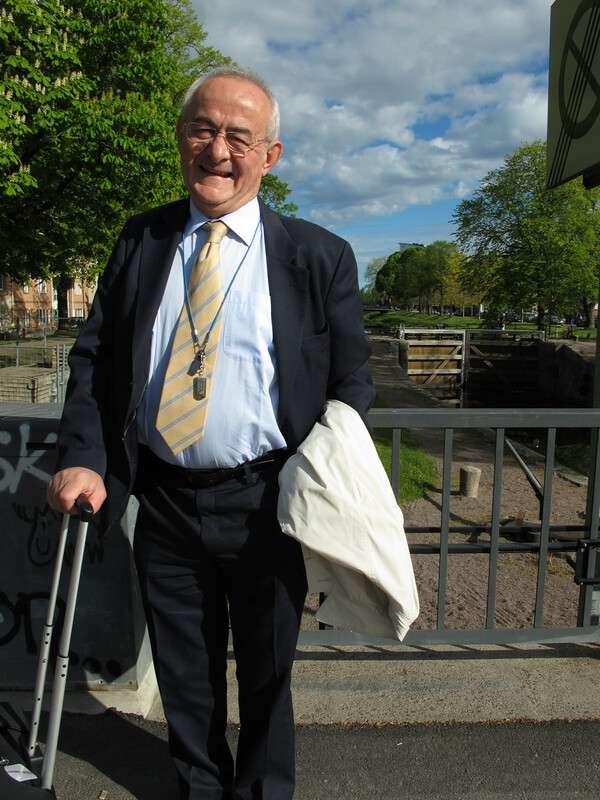 Prof. Čedo Maksimović on a nice walk in Karlstad, Sweden. Professor Čedo Maksimović has nicely invited me to visit his department at Imperial College in London and in November I will finally go there. I met Čedo in the urban drainage conference in Malaysia last year and we came to talk about interesting topics concerning how we build our cities in a new and more sustainable way. Čedo is a person with many good ideas and I am looking forward to meet with him and his fellow researchers in the Urban Water Research Group. I can definitely learn a lot from these people and I hope that I also can contribute a little with ideas from my own work. Čedo and I both find it very important to integrate the urban water systems more in the city. This holistic view seems obvious, but in the same time challenging, to me. As the rain falls over the whole city, it is clear that the stormwater solutions must be integrated in the city planning for all of the urban areas. As we know from floods around the world, we cannot hide the water from the city – it is impossible. Water should be seen as a great resource. With some new thinking we can combine interest like water, energy, aesthetics, food and even joy in the same solutions and thereby win a lot. 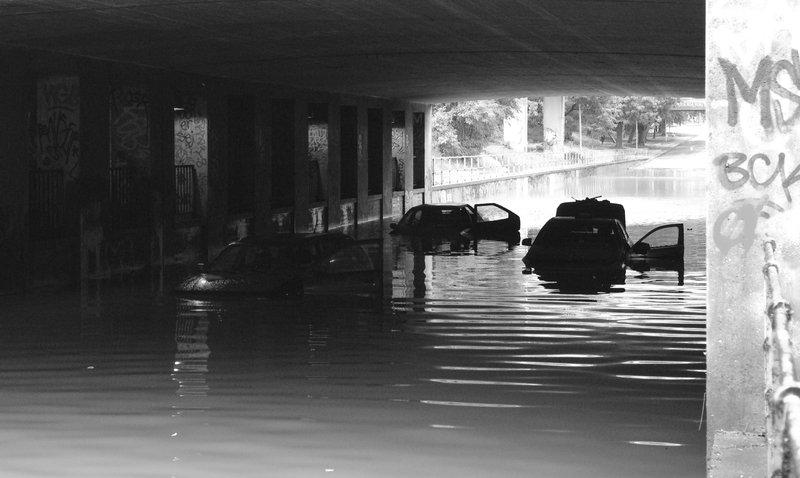 It is today one year since Malmö (Sweden) and Copenhagen (Denmark) were severely flooded on the 31st of August 2014. Copenhagen has already been challenged by floods in 2010 and 2011, while the severity of this flood event was new to Malmö and south-western Scania. The flood has been like a wake-up call for southern Sweden when it comes to how fragile the modern society are to severe stress like from this flood. One year later, this flood event still effects the city: several house owners have not been able to move back yet (! ), a group of employees at the utility company VA Syd are working full time to assess all flood reports from the citizens, at the university we will in few weeks start a big project on urban flood resilience, and Malmö municipality will write their first cloud-burst plan. I write on an article about the flood event in Malmö, where I look into how the city was affected. I compare this flood event with the much smaller, but still severe, flood events in 2007 and 2010, and discuss how we can learn from these flood events in the future city planning. Hopefully, I will submit the article to an international journal in October or November. The local newspaper, Sydsvenskan, writes today about the flood event (in Swedish): Ett år efter översvämningarna i Malmö. They have also collected video clips from the event: Se videoklipp från regnkaoset. 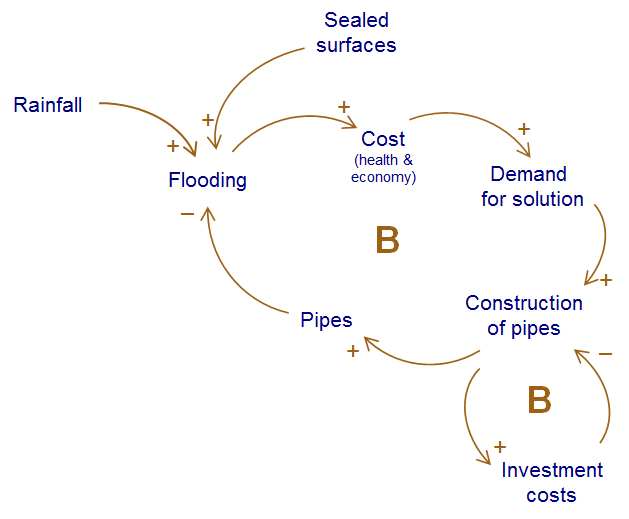 Last Friday, I made a causal loop diagram (CLD) for urban flooding. It is a very simple version that points out the problem that occures when pipe systems are used as the only solution to handle stormwater in the city. I will continue to develop CLDs for my research, both general ones like this and more specific ones. 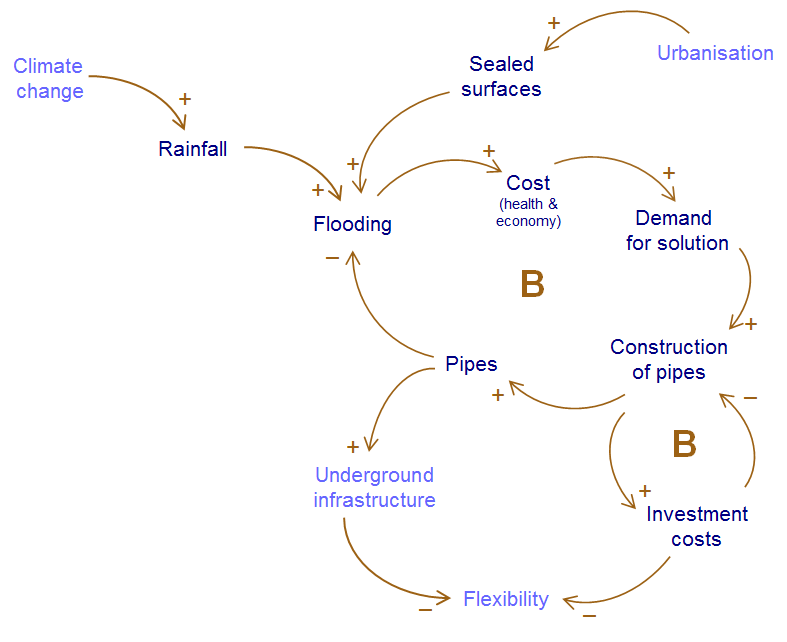 Overview of the drivers behind construction of a stormwater system based on pipes. “Flooding” means here any unwanted stormwater that leads to a cost for the society. Due to climate change and urbanisation, there is a need to change the stormwater infrastructure in the city. This is not possible if the stormwater system is not flexible. Idag skrev forskning.se om vår senaste rapport: Identifiering av extrema händelser och dess översvämningskonsekvenser i tätort. Själva rapporten kan laddas hem från SVUs hemsida. Jag har bidragit med två artiklar till rapporten. Båda artiklarna är konferensartiklar och de handlar om risken för översvämningar när det både regnar mycket och havet samtidigt tränger sig på. Förrutom mina artiklar omfattar rapporten forskning som bland annat Lars Bengtsson (min doktorandhandledare), Arun Rana (vår tidigare kollega, nu disputerad och verksam på ett universitet i Portland, USA) och Karolina Berggren (disputerad från Luleå tekniska universitet) har gjort. Rapporten ger en del intressant läsning till den som intresserar sig för extrem nederbörd och hur översvämningar påverkar våra städer. Sörensen, J., & Rana, A. (2013). Comparative Analysis of Flooding in Gothenburg, Sweden and Mumbai, India: a Review. International Conference on Flood Resilience, Experiences in Asia and Europe. Exeter. Sörensen, J., & Bengtsson, L. (2014). Combined effects of high water level and precipitation on flooding of Gothenburg, Sweden. 13th International Conference on Urban Drainage (pp. 7–12). Sarawak, Malaysia. When I started my PhD study in 2012, everyone said: I see, you live in Copenhagen – over there floods are of great interest. Copenhagen was flooded in August 2010, July 2011 and once more in August 2011. My PhD topic (urban flooding in a changing climate) was of course partly inspired by these three floods, but also by the need to create better cities in the future. We need greener cities and more resilient stormwater systems. This was in 2012 and the interest of flooding in Sweden was rather weak. Then, in 2014, the rain fell. After a few hours of heavy rainfall, floods where suddenly on everyone lips. 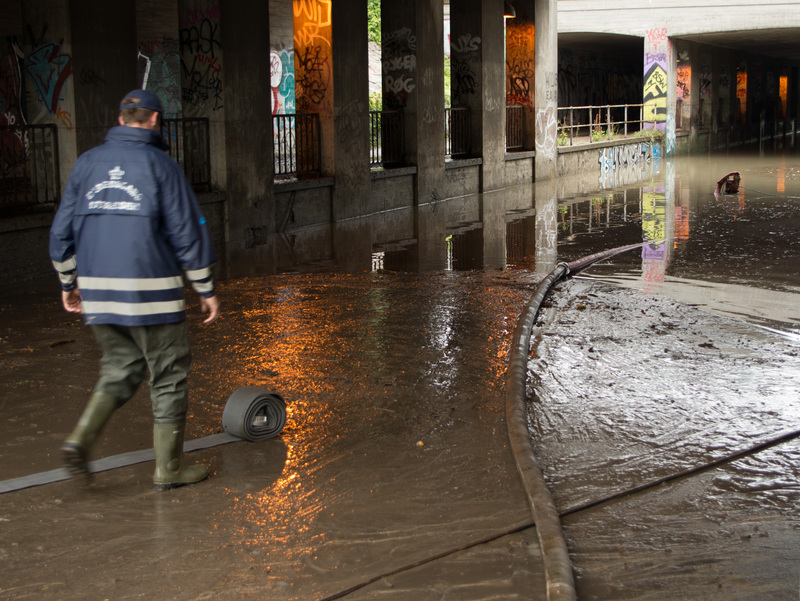 Malmö was hit by a costly and frightening flood event. Now people had their own experience of what a flood could be. It is not any longer a problem “over there”, in Copenhagen. It takes only 35 minutes to go from central Copenhagen to Malmö. Nevertheless, it took the flood risk awareness more than three years to cross the bridge. Gothenburg have seen similar flood events and they seem to be aware of the problem. During a conference in Gothenburg, someone discussed why the national authorities in Sweden still seems so unaware of the pluvial flood risk. As this person mentioned: “We have still not seen a major flood event in a bigger Swedish city – read: Stockholm!” I guess this summarises the problem with risk awareness. It is unbelievable hard to understand the risk of flooding before you have seen one yourself in your own town. On the 31st of august, heavy rainfall hit Malmö in southern Sweden. The city has never before seen such volumes of water in the streets, basements and backyards – at least not in modern time. At Lund University, we decided to take a closer look at the flood event. 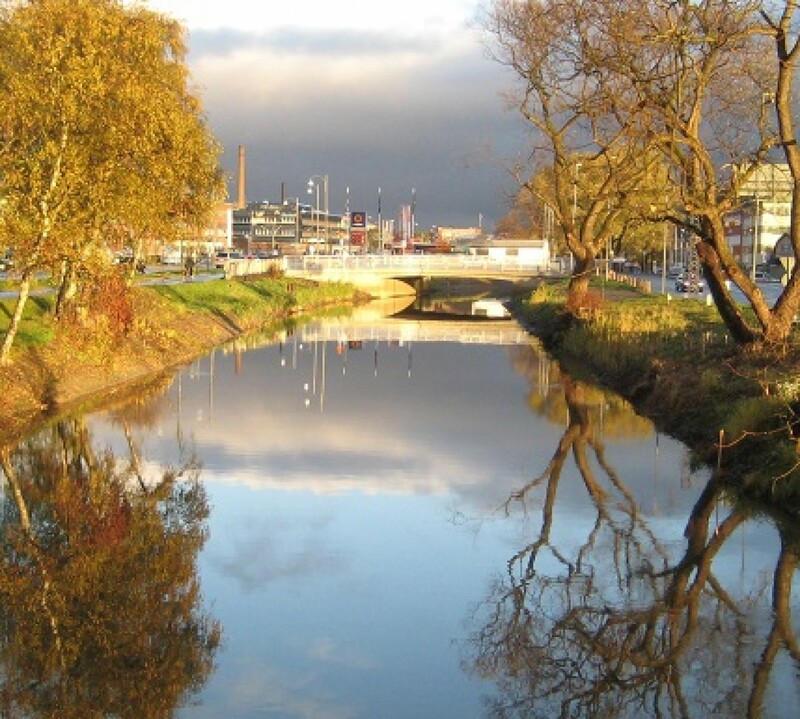 We try to understand how all the green spaces and open stormwater solutions, that Malmö city is well known for, did affect this flood event. 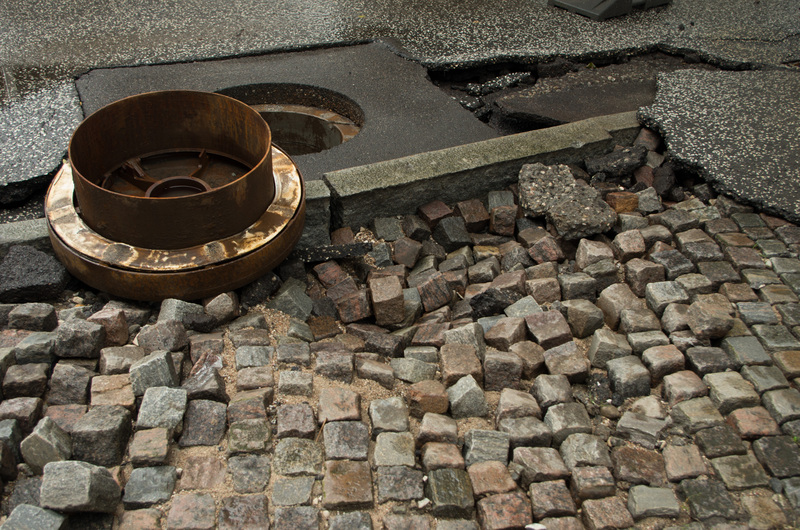 The open stormwater systems in Malmö were not specifically designed to prevent from flooding, but this could be an important, positive side effect of the systems. My student, Joanna Theland, have contacted the utility company (VA Syd), insurance companies and house owners in Malmö, to collect information about consequences of the flooding. Everyone have been very helpful and we have had interesting conversations with both VA Syd, Länsförsäkringar Skåne (an insurance company) and others about this flood event and flooding in general. I would say that Swedish authorities are getting more and more focused on floods and flood prevention. We are going from an idea that floods are a natural catastrophe that we only can act upon after the disaster already has happened, to a more proactive view were we see possibilities to prevent areas, important buildings, as well as our own basement from flooding. There is a great interest in our study and in how to build cities in a better way in the future. Joanna Theland will present the results from this study in March. After this, I will continue with more analyses. One idea is to compare the situation in Malmö with other cities that have seen recent flood events. One might be Helsingborg, as my contacts there (at NSVA) have been very helpful. The photos beneath are all from Copenhagen. 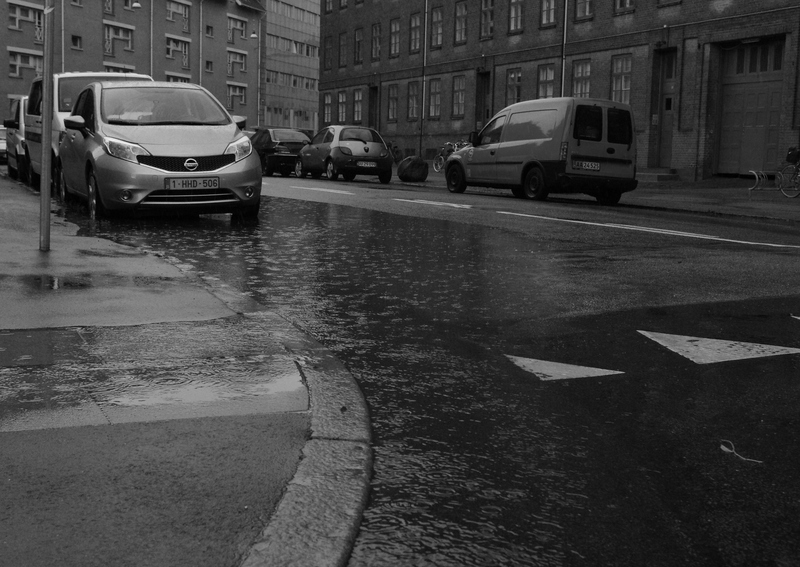 The same rainfall as in Malmö, on the 31st of august 2014, stroke Copenhagen and I took a trip with my bike to document some of the consequences in the city. 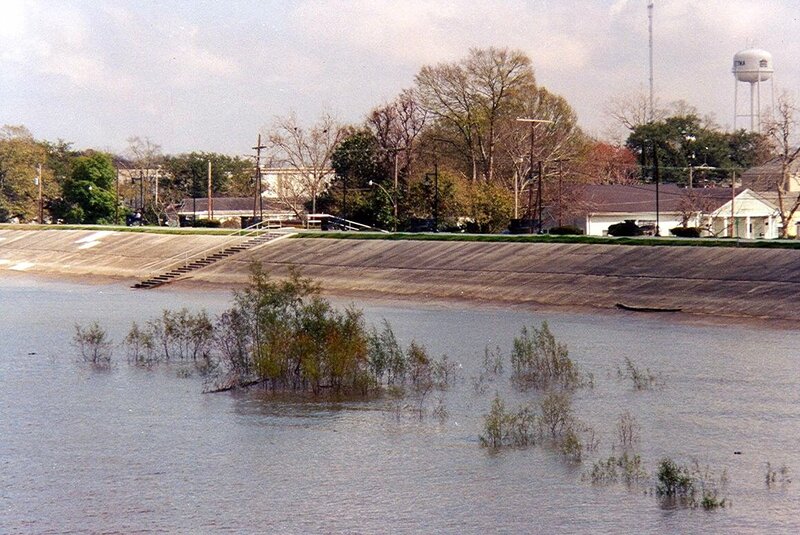 Conventional dike in Gretna, Mississippi. Turn flood dikes perpendicular to the coast, so they point at the sea. Stop to fight against the nature and let nature rule your city. This was the radical message when Anuradha Mathur and Dilip da Cunha visited Malmö in March 2014. The new ideas are now discussed among city planners and architects. There is a saying that ‘there are two kinds of dikes – the ones that did break down and the ones that will break down in the future’. We design dikes with standards that should lower the risk of failure and we choose a safety level for the dike. But, there is always a limit for the construction. One day the dike will break down or water will overtop it during an extreme storm. The clear message from Mathur and da Cunha is that we should stop to fight the nature with dikes. Their idea is to turn the dikes or levees around and use them for evacuation when a flood comes. On top of the levee buildings could be constructed. Here is a good and safe place for vulnerable buildings, but also for schools. During a flood – because flood will come, these buildings will be used as evacuation centre. In the future, we will see higher sea water level due to climate change. Mathur and da Cunha claims that the future sea level rise challenge our understanding of the sea. We need to rethink the urban design fundamentally, as the sea will eat a lot of urban areas along the coast lines. It is not possible to compete with nature. As the city will be flooded more often with the new turn-around dikes, people will get more aware of the risk and therefore construct the city in a smarter and less risky way. This awareness contributes to flood resilience for the city. Sometimes people claim that we should ‘construct natural dikes’. This is an engineering approach to nature, says Mathur and da Cunha. The nature works in systems and not in functions. In Norfolk (USA), where they currently are working with the sea level rise problem, the military base is dominating and the military way of thinking is wide-spread: Conquer the fronts. Conquer the land from east to west. This thinking also transfers to the cities fight against the rising sea. Mathur and da Cunha explained how they work with this idea on conquering and that they could see a shift in people’s idea when they gave workshops about it. In their workshop people would learn how natural systems could be used in an effective way for protection. We should work together with nature and see the sea as a friend, they say. It is time to stop fight against nature.